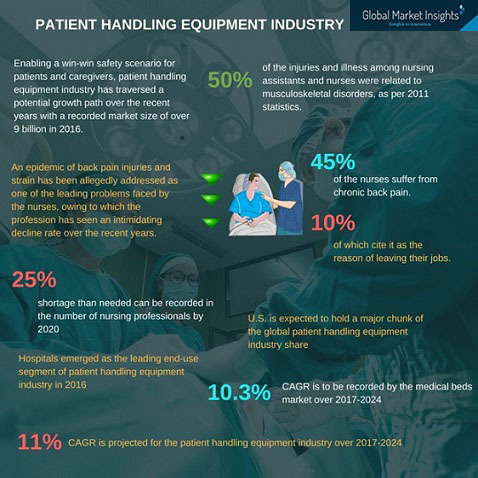 With the evolving emphasis of healthcare fraternity on patient-caregiver safety, patient handling equipment market has indeed established itself as one of the integral verticals of medical devices industry. Over the recent years, there has been a perceived demand for technologically advanced equipment to lift and transfer patients, in response to which, the patient handling equipment market has been gaining heavy momentum, with a recorded share of more than USD 9 billion in 2016. One of the chief factors that stands as a strong driver fueling the growth of this domain is the growing emphasis of medical assemblies toward safety of caregivers, particularly nurses. It is prudent to mention that the issue of musculoskeletal injuries has been prevalent in the nursing profession with quite a phenomenal surge rate since 1980s, a factor that has remarkably increased the healthcare burden in terms of both efficiency and fiscal parameters, in extension carving a lucrative roadmap for patient handling equipment industry. Manual patient handling has reportedly jeopardized the goal of effective care delivery, for both the caregivers as well as patients. An epidemic of back pain injuries and strain have been allegedly addressed as one of the leading problems faced by the nurses. As per reliable estimates, more than 45% of the nurses suffer from chronic back pain, among which more than 10% cite it as the reason for leaving their job. Another daunting statistic, in this regard, was recorded in 2011 which stated that more than 50% of the injuries and illness among nursing assistants and nurses were related to musculoskeletal disorders. This data further proclaimed the nursing assistants to be the leading personnel suffering from this disorder, while the nurses ranked 5th in the occupational hierarchy. The intimidating number itself bears a testimony to the declining number of nursing professionals at a global level, and is indeed a chief factor to intensify the growth of patient handling equipment industry share. In fact, estimates claim that the shortage of nurses can be as much as 25% lesser than needed by the year 2020 – a concern that strongly demands prompt action. In response to such a strong need to ensure caregiver safety, patient handling equipment industry players have acclaimed the integration of technology in the patient management equipment for lifting or transferring the patients. In this regard, HoverTech, a leading patient handling equipment market player has recently launched its new series of highly breathable HoverMatt® Single-Patient Use (SPU). The latest product can be rightly touted as one of the most appropriate models blending the expertise pertaining to the patient as well as the caregiver safety. Reportedly, SPU not only protects the patient’s skin by eliminating shear and friction, but also enables safe transfer, turning, and positioning of patients for the caregivers without causing strain or muscle injury. Speaking along similar lines, some of the other players constituting the product and service landscape of patient handling equipment industry are Hill-Rom, Paramount Bed Holdings Co. Ltd. Stryker Corporation, and Getinge Group. Hospitals can be aptly addressed as the leading end-users contributing to a major chunk of patient handling equipment industry growth, courtesy – the segment having procured the largest ration of the business share in 2016. Reportedly, the prime reason fueling the growth of patient handling equipment industry demand from hospitals is the massive surge in the number of patients requiring critical care at a global scale. These patients demand for constant and close health monitoring and usually are admitted to intensive care unit (ICU). As per reliable estimates, close to 5 million people on an annual basis are admitted to ICUs in the U.S. Statistics also quote that more than 20% acute care admissions and 58% of emergency department admissions result in an ICU admission. The data bears a testimony to the exponentially increasing demand for medical beds which are one of the key products of patient handling equipment industry. Allegedly, over the period of 2006-2010, the overall number of critical care beds in the U.S. increased to 77,809 from 65,579 registering a forward leap of 15%. The region is also claimed to have approximately 400 pediatric ICUs and 1,500 neonatal ICUs, comprising 4,044 beds and 20,000 beds respectively. The data overtly explains the commendable growth of U.S. patient handling equipment market share which reportedly led the global landscape in 2016. It is prudent to mention that medical beds will not only witness a massive demand in the U.S. but also at a worldwide level, driven by factors such as growing aging population, improved life expectancy, and advancements in healthcare delivery. In fact, estimates claim medical beds to have procured the largest share of patient handling equipment market product landscape in 2016. The segment is further projected to witness a CAGR of 10.3% over 2017-2024. The recent trend in the application landscape of patient handling equipment industry is the paradigm shift in the focus toward home care settings than admission to hospitals. The growth can be credited to the cost as well as comfort quotient. As per estimates claimed by Global Market Insights, Inc. home care settings are slated to witness the fastest growth with regard to patient handling equipment industry demand over the period of 2017-2024. Add to this, the exponential surge in geriatric population will further contribute immensely toward patient handling equipment market growth. This shift is particularly prevalent in Asia, which is rightly addressed as the population giant, with its size of older population (617 million in 2015) and its present share in the global geriatric population base (more than 50%). As per reliable reports, by 2050, close to two-thirds of the world’s geriatric population will reside in Asia. In this regard, it is certain for Asia Pacific to claim a massive progression in global patient equipment handling industry landscape, with Japan as one of the prominent revenue pockets. In 2016, Japan reportedly held the largest share in APAC patient handling equipment market and is estimated to witness a strong demand in the coming seven years, with phenomenal technological interference in the medical devices landscape such as launch of robotic wheelchairs and advanced mobility equipment. Endorsed by a huge number of market participants, patient handling equipment industry is highly competitive. In such a scenario, technological advancements of products stand as a vital quotient outlining the sustainability and profit parameters for the share contenders. In response to this, the patient handling equipment market has been witnessing huge investments in R&D to integrate technology upgradations in the equipment taking utmost care of the duo safety (patient-caregiver). Citing an instance, in May 2017, Hill-Rom Holdings, Inc., one of the profound names in patient handling equipment industry launched its wound care solution dubbed Hill-Rom® Envella™ Air Fluidized Therapy Bed. The bed, with its adjustable air flow and sensing technologies, optimal weight-based pressure distribution, and increased bead depth, is designed to provide comfortable and safer air fluidized therapy for both patients and caregivers. Upgrading the equipment not only provides a safety check but also makes sense from business point of view for the healthcare units. Investments in these equipment might involve an initial hefty capital but undeniably also saves the medical facilities from a huge amount of fiscal and resource losses by preventing workforce injuries which leads to additional costs, averting days away from work which causes inefficient work environment, and of course enhancing care delivery for patients. In fact, as per estimates, patient handling injuries, with regards to wage replacement, are one of the most expensive types of hospital worker injuries. Reportedly, the claimed significant initial cost of instituting safe patient handling policies, can be recovered in less than five years. Below are some instances depicting the path traversed by patient handling equipment market over the past years, in terms of its demand, commercialization, and applications. The safe patient handling program which profoundly outlines the base of patient handling equipment industry has been notably recognized for causing a remarkable reduction in number of employee injuries and lost work days due to these injuries. In 2006, a remarkable decrease in injuries in terms of severity and frequency was observed when 31 rural hospitals in Washington executed a “Zero Lift Program”. The program replaced transferring, manual lifting, and patients repositioning with mechanical lifting and deployment of patient assisting equipment. The frequency of patient handling injury reportedly recorded a 43% reduction and the overall incurred loss per claim decreased by 24%. Speaking along similar lines, mechanical and transfer equipment have witnessed a strong commercialization in the product landscape of patient handling equipment industry and are anticipated to witness analogous trends in the ensuing years. According to a 2013 data, Tampa General Hospital in Florida, post deploying lift teams to do patient repositioning and transfers, observed a commendable decrease of 65% in its patient handling injury rate. Tampa General Hospital, also observed a 92% reduction pertaining to compensation costs for patient handling injuries, post its deployment of lift teams. Data recorded in 2011 also quotes one such instance validating the rising growth curve of patient handling equipment market. Seemingly, Englewood Hospital and Medical Center, New Jersey, registered a 57.1 % reduction in workplace injuries and 80.5% reduction in lost work days, post implementing a culture of safe patient handling. Kaleida Health Network, New York’s largest healthcare provider, in 2004, invested USD 2 million in safe patient handling program and observed a full ROI within three years of its implementation. Considering the aforementioned aspects, it is quite precise to mention that patient handling equipment market is yet to explore a plethora of opportunities on a global scale. Implementing these devices not only assists in safe patient handling but is also an astute investment in terms of medical assemblies’ bottom line. Of course, the industry’s full potential can be realized only with the joint efforts by both the government as well as private entities toward patient-caregiver safety. In all likelihood, the patient handling equipment market is sure to attain remarkable stature in terms of its product developments and revenue graph over the coming seven years. The evolving healthcare IT market, as estimated by analysts, will also leave a perpetual impact on the patient handling equipment industry, with anticipation of robotics and AI soon to be incorporated in these equipment. In terms of commercialization, global patient handling equipment industry is projected to surpass a revenue of USD 23 billion by 2024.